Our first encounter with Rocinante was a dazzling experience. She was our first new RV, ever. We loved her - still do! We were overwhelmed with what we were seeing. We thought she was beautiful, new, and flawless. Right on the first two, wrong on the third. She was anything but flawless, thanks to what appears to have been a weak QA/QC process at Airstream. After 2 years of breaking in Rocinante and repeatedly taking her in for minor warranty issues, we've come up with a quick list of things we wish we had looked at harder during our first tour. Some items on this list, we didn't look closely enough at during our "acceptance tour". Others are reminders for us to look more carefully, just in case, if we ever decide to buy another new trailer. This is about the tour the dealer provides just before handing over the keys and helping the proud new owners hook up the trailer to take it home. It needs to be far more than a courtesy tour. If we had looked at our new purchase with a proper set of eyes, we would have found things wrong with it, some of which would have caused us to leave the trailer with our dealer for pre-pickup warranty work and then come back in a week or two after they'd fixed what we found before even leaving the lot. Being a pair of RV "newbies" we thought this process would take about an hour. Wrong. It won't take all day, but be prepared for it to take at least a couple of hours, if not more. Next time we'll insist on an early pickup appointment and keep our calendar open for the entire day so we can take whatever time is required to get it done right. This is a very exciting time, and it is important to take lots of notes - we definitely didn't remember it all. Perhaps we should have taken pictures and maybe even a video of the tour. During the acceptance tour, expect to find at least one thing wrong. If nothing is found, we probably weren't paying close attention. * Check every bit of the electronics - play a DVD, try watching TV fore and aft, listen to a radio station. * Unless the trailer has a fixed antenna, crank the antenna up and down. While watching the TV, turn the antenna booster off and on again to verify that it works. *Turn on the inverter and plug something into it - like maybe a TV. * Walk around the outside of the trailer looking for any possible dents, scratches, etc. If at all possible, get up high enough to look at the roof as well. If anything's amiss, we want it fixed before we take the trailer off the lot. * Have them show and then clearly mark the jack locations on both sides of the trailer. 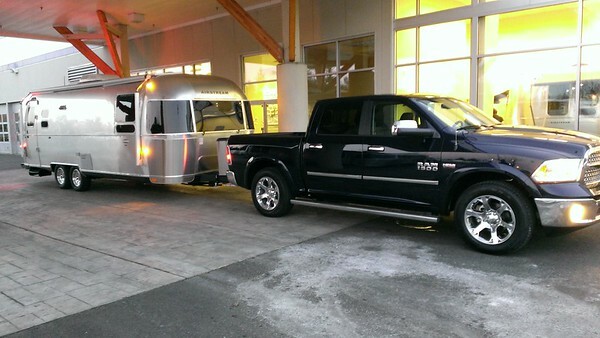 If an Airstream is put on a jack, it's imperative that it be done right to help maintain the integrity of the unit. * While we're there, have them explicitly check the skylight flanges from outside, on the roof, to be sure they weren't cracked in the factory by an overenthusiastic tightening of screws. * Verify the fit of the entry door. Can we see any air space between the door and the frame at any point when closed? Believe it or not, our door was a terrible fit, and this was a serious problem for Rocinante. * Open, adjust and close the awnings. All of them. Several times, until we really understand how they are supposed to work. Have them demonstrate each of the possible awning positions. Again, take notes, pictures and maybe even videos. If the main awning is electric, have them show exactly how to manually retract the awning if something goes wrong with that system. * Closely examine all seams and windows to ensure they are properly sealed. Sealant on the Airstream is only warrantied for six months, so it's important to get on this immediately. If any sealant is imperfect (cracked, gaps, missing in places, etc. ), have this repaired right away. We want this fixed with Acryl-R. No silicone of any kind should ever be used on our trailer's aluminum! * If there is a front compartment door (e.g. 27FB Queen), check the fit, as this can be a primary source of leaks while towing in the rain. Turn on the light inside the compartment and close the door. Then look around the door to see if any light leaks out. Turn off the light and raise the bed inside to see whether any light comes in around the storage door. If light gets through in either direction, water will get in there. Chasing and trying to eliminate this leak has been our single biggest annoyance. * Try all the fans in the ceiling, including those in the shower and the bathroom. Check to see that they are properly installed at least on the inside - no loose corners, all the screws are properly seated and anchored, etc. * Turn all the lights on and off again to make sure they work and that all are securely mounted. Try out all the dimmer switches. This includes the outside light over the door, which we've had serviced several times due to flickering. * Go over the interior carefully, looking at the walls and ceiling for any popped rivets. This is tedious and time-consuming, but it will also help us get to know our trailer and appreciate the work that went into building it. * If the rig isn't winterized, put water in the fresh tank and pressurize the system by turning on the water pump. Run water from every faucet and flush the toilet. Also try running water from the fresh tank to verify that the pump works. Once we're sure all the lines are filled with water, shut off all faucets, leaving the pump on. If the pump periodically runs even with all faucets off, the system has a leak which must be found. In any case, check under the kitchen sink to see whether there are any leaks in the water lines or the drain pipe. Start the hot water heater and see that it works. Have them fill and then empty the fresh, black and grey water tanks, showing whether the tank metering system works and that the grey / black water valves work. Based on our experiences in Rocinante with the "Micropulse" branded system, chances are good that the tank meters won't be even remotely accurate. Chances of success may be better if the tank gauges are See Level II or See Level III. If there's a problem, best to find out now and get them started fixing it. * If the rig is winterized, check the above items out ASAP when we open the plumbing for business. If the dealer is far from our home, have them "water up the system," demonstrate everything above, and then re-winterize so we can be sure everything is good before we leave. * Have them lift up the mattress and clean off the plywood base under the bed(s) - it's likely covered in dust - ours was filthy. We want that gone before we take the plastic off the mattress. * Test every single door, cabinet door, curtain, shade, divider, drawer and latch to see that they work as expected. Make sure there aren't any loose screws or hardware. * Slide all sliding doors open and then closed again - even the ones in the bathroom - to ensure they work properly. * Try out the oven, the cooktop, and the microwave. * Turn on the fridge - it won't get cold enough to matter during the inspection, but we can see the light turn on when we open the door. Also, try running it on both 110VAC and propane to ensure it switches nicely from one to the other and back. * Have them run a manometer test on the propane system to ensure there are no leaks and have them fix any leaks found via the test. * Check the LEDs on both shore power inlets: fore and street-side, to make sure they light up as expected when power is applied. While doing this, also verify that power correctly switches from one shore power inlet to the other as you move the power cable to from one port to the other and then back again. * Check the voltage and available amp-hours on the coach batteries - a trailer that's been sitting on the lot for a while may have batteries that were allowed to repeatedly discharge. Ideally, get both a load test and a capacity test. If the batteries are bad, we don't want them - we want new ones. Our first clue on this may be that when we prepare hitch up for the first time, the jack fuse blows as we try to raise the trailer's tongue. If that happens, we probably have low batteries; lower voltage causes the jack to draw more current, and that blows the fuse. So, if the jack blows a fuse repeatedly on the first hitch up at the dealer, we want them to put in new coach batteries before we're willing to take the trailer home. If we had done that with Rocinante, it would have saved us some time later on - we eventually persuaded them to make the battery swap for us under warranty. * Try out the propane-fired furnace. Does it smoothly and quietly blow warm air? * If they have sufficient shore power, try out the heat pump / air conditioner. If the trailer has ducted air, check every air vent to see that they are all moving air. If they don't have sufficient shore power, ask them to get some so we can do this important test. At the very least, turn on the fan for the heat pump / AC to see whether air moves properly around the RV. It should be possible to do that without running the compressor. * Camp someplace nearby the night after we pick up the trailer and try everything out on our own. Make camp, cook dinner, sleep there, and then make breakfast before leaving. This is also a good time to try out our checklist for arriving and leaving a campsite.